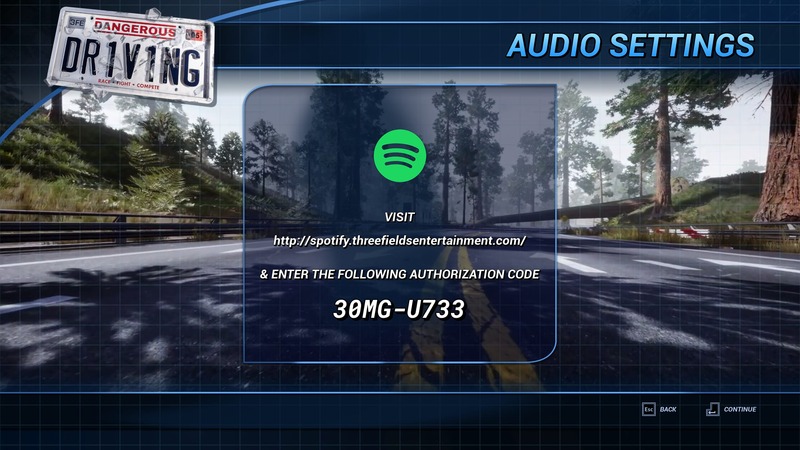 We are delighted that the music in Dangerous Driving will be delivered via Spotify which is a first for racing games. Follow ‘Three Fields’ to see our dream playlist. 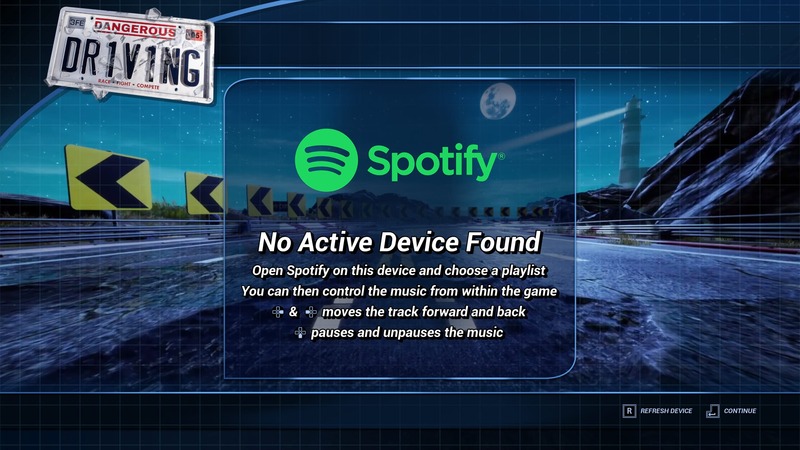 Whilst Spotify has existed on console for a while not everyone remembers to go set it up and also you have to either control it from another device or keep exiting the game to change track etc. Its not integrated. 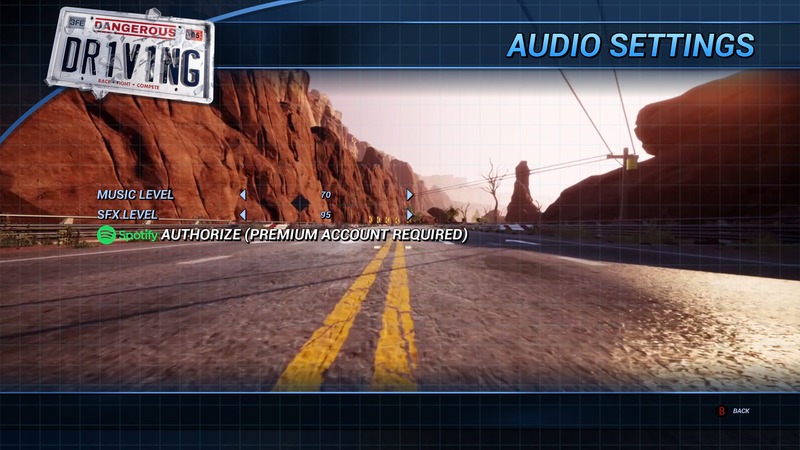 You’ll be able to authorise it from within the Audio Menu and from then on you’ll be able to control your music from within the game. And the current implementation is, we hope, just the start of a fully featured integration which includes gameplay triggered music! Here is a quick guide to getting Spotify working in Dangerous Driving. Spotify needs a premium account. Authorization will fail if you don’t do this. This will give you a code (example below). Enter the code at spotify.threefieldsentertainment.com. Note: You don’t have to match case or hyphens. Zero and Capital O look very similar, but zero has a diagonal line through it. Codes expire after 10 minutes. If your code is not recognised try again after 10 minutes and get a new code / enter it on a different browser. If you accidentally link the wrong account you will need to load up your Spotify account and log in to the Apps page and Remove Access to Spotify from Dangerous Driving. You can then link it to the correct account. Once you have entered your code, make sure you Continue from the screen by pressing A or X. Back cancels and will always fail. Continue will check authorization. Once you have Spotify authorized make sure you have Spotify running on the device (PlayStation4, Xbox One or PC) and choose a playlist. You will then be able to control that from within the game. The current implementation is, we hope, just the start of a fully featured integration which includes gameplay triggered music! 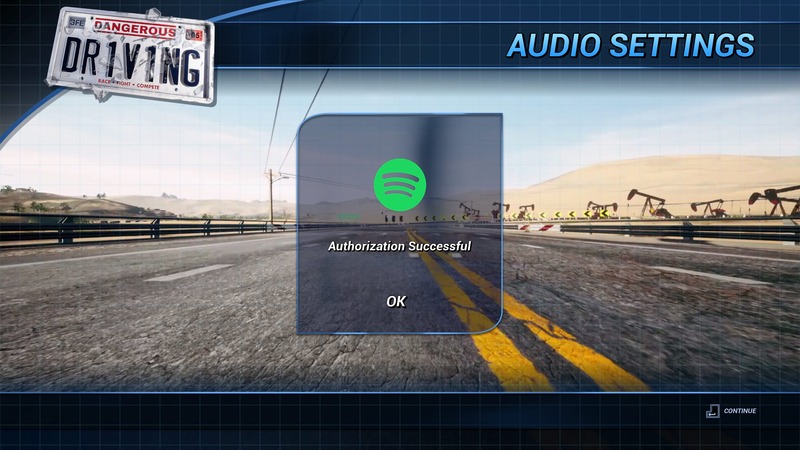 If you see the screen below you will need to ensure that Spotify is running on your Xbox/PS4/PC. Go out to the dashboard/minimise the game etc and open Spotify and then return to the game.